Tandem, paragliding flight - Flying grounds around Sofia, Pernik, Sopot - ski lift, Beklemeto. In Rodopi mountains - Dobrostan peak, in Rila and Pirin, Malyovitsa, Musala, Bansko, Dupnitsa, Vratsa, Montana, Pravets and others. 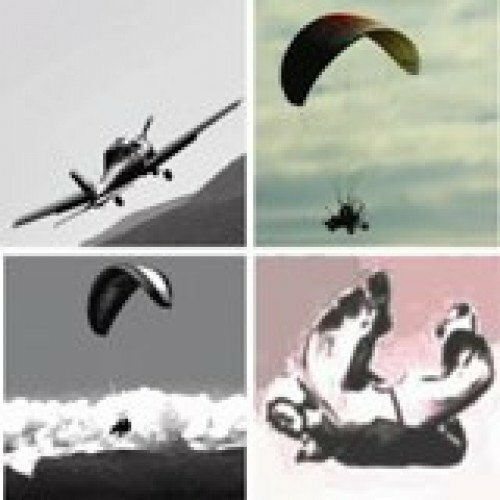 Motor motordeltaplane or paratrike flight - flying grounds near Sofia, Ihtiman, Slivnitsa, Pravets, Sopot, Sliven, Kazanlak, Plovdiv, Shumen, Varna, Burgas, Vratsa, Montana and others. Ultralight aircraft flight - a trial lesson - airport near Sofia - Slivnitsa, ИIhtiman, Dolna Banya and Lesnovo, Belozem near Plovdiv, Balchik near Varna, Primorsko near Burgas and others. All flights can be performed during the winter /without the aerodium/ with certain limitations of the flying grounds and additional charge in some of the winter resorts. 4. Certified equipment, reserved parachutes and personal safety devices. 5. You can choose any flying ground in Bulgaria. 1. The adventure depends on the meterological conditions and the schedule of the flying centers. 2. The price is for one person. 3. Timing – the flying can be done throughout the whole year with certain limitations during the winter. 4. You need to get to the flying ground by your own means of transportation or if possible together with the pilot to certain flying spots, there might be places to go on foot. 5. The flights are performed by experienced pilots with tested and certified equipment. 7. Please wear suitable clothes and comfortable shoes, medicines if needed. *HD Video recording is done by action cameras, attached to the flying equipment or to the hand of the instructor. The ultralight aircraft does not allow recording from the outside and thus we compensate you by adding some flying time to your experience. You can use your own camera inside the plane. The raw material is transfered to a memory card of the client or is uploaded on virtual servers. *The transportation option depends on the location: ski-lift, cross-country jeep, shuttle or other. If you would like additional information for this adventure, please call us at +359 888977117 or visit our website supergift.bg to find out information for more gifts.